In 1913, Harry Clark's Brews brought Milwaukee their first baseball pennant. One hundred years later, we share a rare artifact from that championship season. 30,000 excited fans welcome home their conquering heroes; the Milwaukee Brewers arrive at the Chicago Northwestern railway station in downtown Milwaukee, Wisconsin. 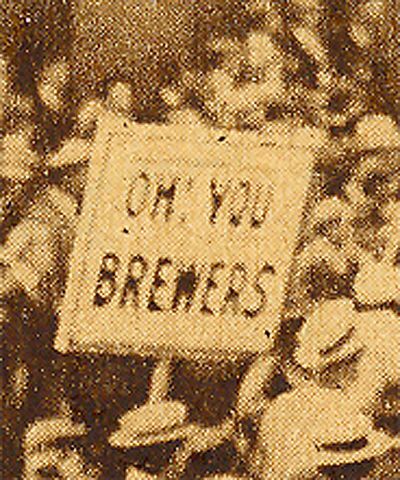 Cheering fans and signs declare "Oh You Brewers" as the team, led by player/manager Harry Clark, had just brought home their first pennant for Milwaukee since joining the American Association in 1902. The Brews completed the season with a exemplary record of 100 wins vs. only 67 defeats, finishing 3 games ahead of their closest rival, the Minneapolis Millers. While it is exciting to see images such as this from 1913, it is such a limited view of our past. It is hard to imagine what it was really like with just the black and white images of those bygone days. That world like today, was not black and white and thanks to those who have saved memorabilia from the past, we can add a touch of color to this history. As can be seen in this rare pennant, which sports that same popular phrase used back then, "Oh You Brewers," the usual lack of hue is replaced by brilliant yellow and navy blue. Unlike today, cameras in 1913 were bulky and primitive, so the photographs and coverage of sports from that period lacks the focus we are used to 100 years later. As disappointing and limited as they may be, the images we do have are important. 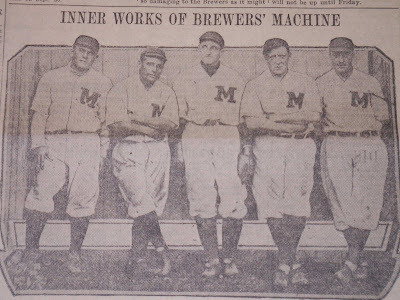 The most commonly seen photograph from 1913 is this one, showing the Brewers at Athletic Park ( as it was known before being named Borchert Field) in their brand new home uniforms. 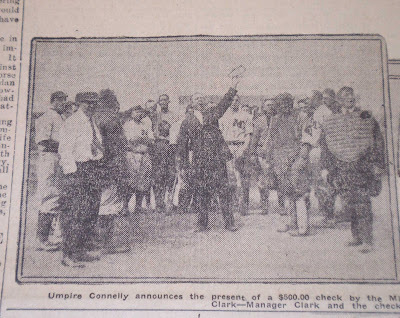 This image has been reused many times in local newspapers when discussing the 1913 season over the years. Recent research by author Dennis Pajot shows that this team photograph dates between late May and June 26, 1913 based on the time Ralph Cutting and Larry Chappell purchased their goat and the timing of Jimmy Block's suspension from the team. This author has also confirmed that this uniform was used throughout the year for home games during the 1913 season. 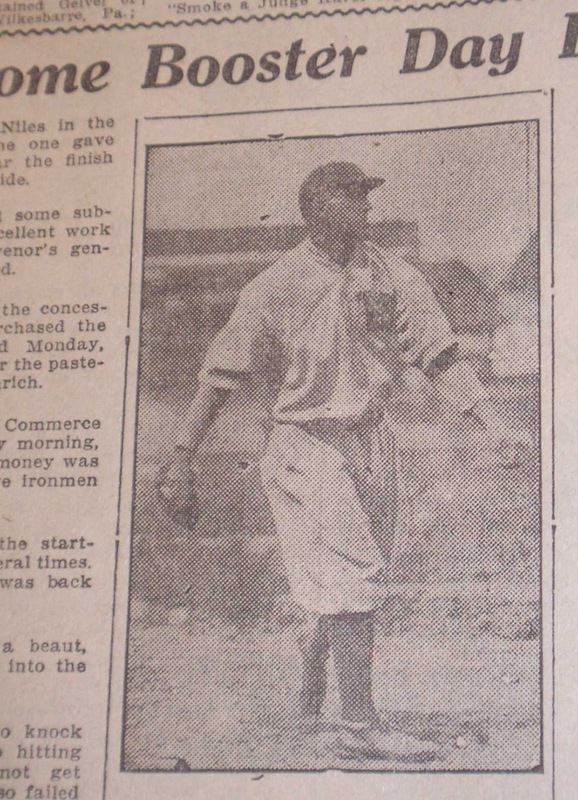 Here are some rarely seen images I have gathered from some "very fragile" newspapers in the Milwaukee Public Library collection. All of these photos were published from May through September of 1913. 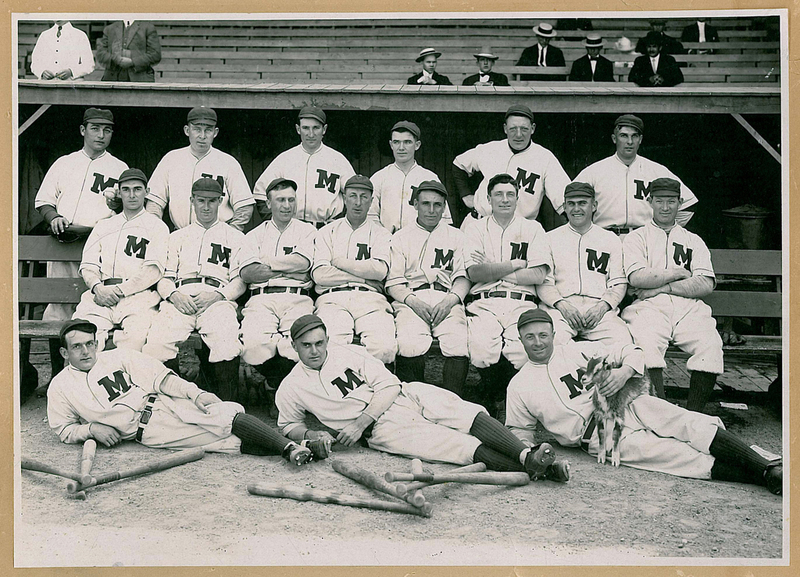 As for the before mentioned 1913 team photograph, several original prints are known to exist. The Milwaukee Public Library has one in their collection and I have had access to another, thanks to a fellow collector who has allowed me to take a high resolution scan of it for my research. This photo has provided me with exacting detail so as to be able to compare it with an actual jersey from the 1913 Milwaukee Brewers, seen here for the first time. The jersey is a professional style jersey manufactured by P. Goldsmith and Sons of Cincinnati, Ohio. A somewhat hard to read label, but this photograph from their 1914 catalog shows this logo rather clearly. This unique logo helps us to place the age of this jersey as being from this time period. An important detail in dating this uniform jersey is the design of the "M" on the front left chest area. 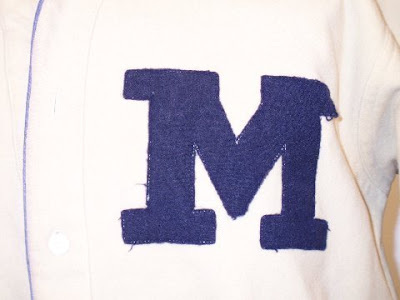 While this "M" may look typical, it is very unique in structure and was used for only a short period of time by Milwaukee. A close examination of the structure of this "M" reveals that it is made up of 3 parts. An outer and inner "I" beam with a "V" in the center. What makes this style so distinctive is the "V"'s placement and the resulting sword shaped gap where it meets the tops of the "I" beams. 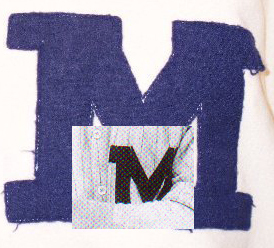 This is a critical detail, because there was a design change in the "M" styling for the 1914 season. 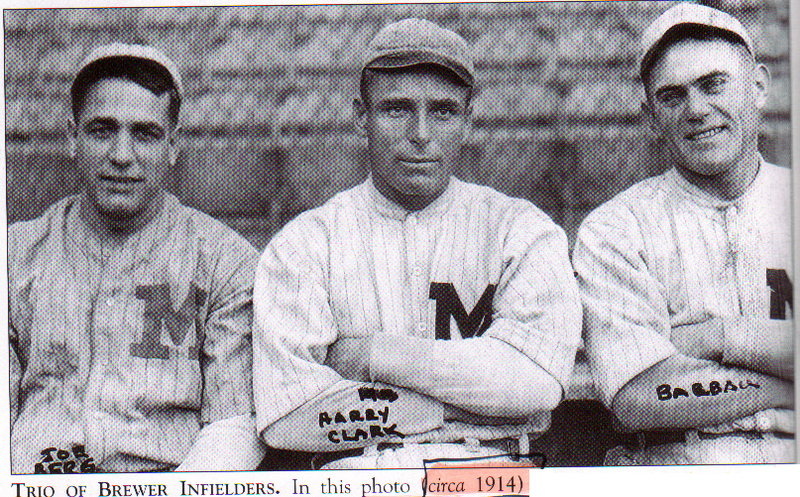 A new "V" shape can be seen in the "M" on Harry Clark's home jersey. (seated in the middle in this photograph) The sword shaped gap is replaced with a smoother looking "V". Note how the tops of the inner "I" beams have changed by the positioning of the "V". To the placket where it buttons, and even the sleeves have the this piping. 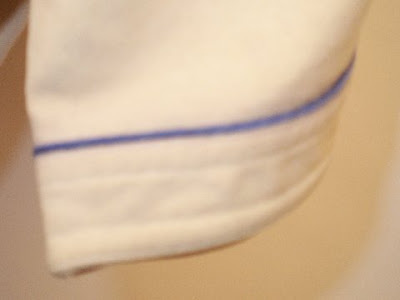 Even the stitching details of the sleeve are distinctive and unique to this jersey. 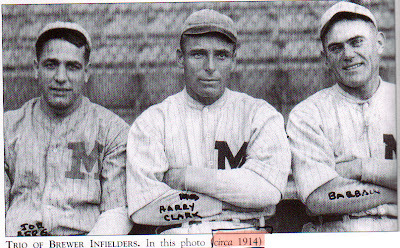 All of these details show up under high resolution in the 1913 Team photograph. 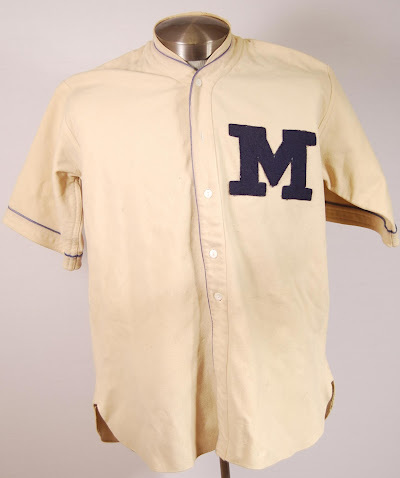 My only speculation would be that the Brewers plain style home cap would more than likely, match the navy blue color of the "M" on this jersey. Examples of minor league uniforms from this period seem to be few and far between. 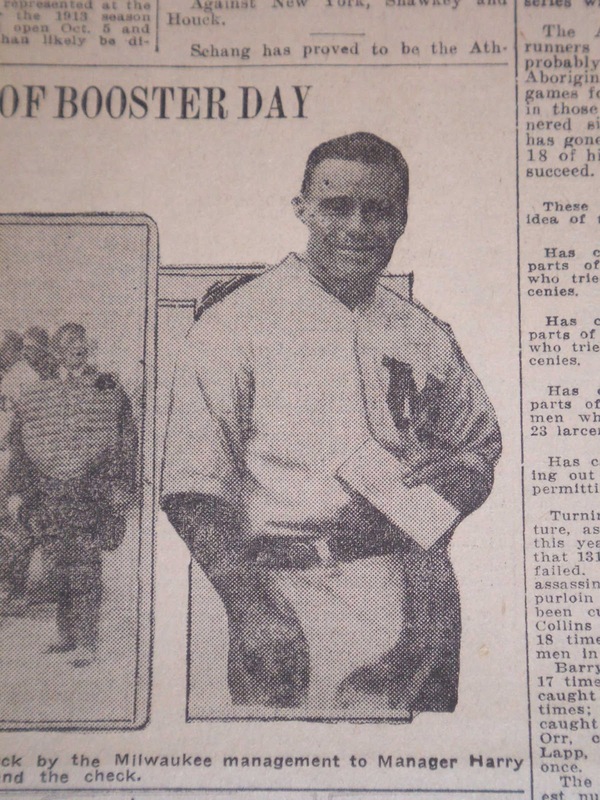 Photography from this era shows that it was commonplace for uniforms to be used and reused in practice sessions and especially during spring training. It is no wonder so few survive. 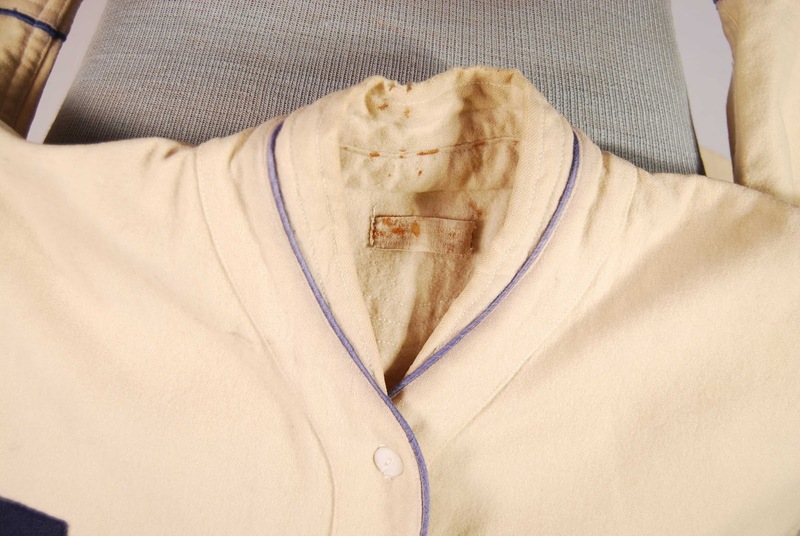 To find a hundred-year-old uniform like this is like uncovering buried treasure from Milwaukee's historical past. Hopefully this is just the starting place that will inspire others to search for more examples from other years. February in Wisconsin is a challenging time of year. Surrounded by the stark reminders of our longest of seasons, winter, with it's blacks, whites, grays and freezing temperatures. It is no wonder that we always are looking forward to the spring, where this monochromatic reality changes to visions and dreams of blue skies and green fields. How fitting it is, that as the modern day Milwaukee Brewers head to warmer climes and spring training, we have this sense of renewal and anticipation. It is with this hope of the approaching season that I can look back to 100 years ago when Milwaukee captured its first championship and dream that a century hence, the major league Brewers are overdue for winning their first Championship for Milwaukee. LET'S DO IT AGAIN IN '13 !! !